Using a custom made, high resolution graphics display, these instrument provide excellent daylight readability, even in direct sunlight. In addition they all have built in backlighting making them easy to read at night time. It includes a rotary control plus 2 independent keys for easy menu navigation and to access specific instrument features. The infinity range also has a switch mode power supply allowing the instrument to be used in both 12V and 24V aircraft as well as for reduced power consumption. It also features built in reverse and over voltage protection. Instruments format details and template in "Infinity_DIM_EN.pdf"
The cutout drawing in .DXF format is available there "mgl_infinity.dxf"
The onboard VSI indicator is altitude compensated and can be displayed in either feet/minute (ft/min) or meters/second (m/s). It also offers a digital readout with a wide range from +/-20 ft/min to as high as +/-10 000 ft/min, it also offers a logarithmic analog display with a +/-2000 ft range. 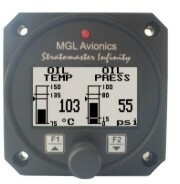 The VSI can be calibrated by the user once the instrument has been installed in the aircraft. 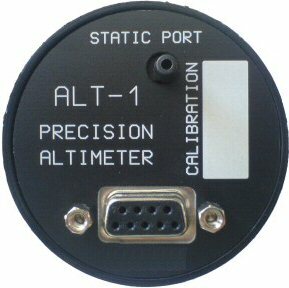 In addition the ALT-1 provides an OAT sender which is used in the determining the density altitude of the aircraft. The ALT-1 can also be used to measure relative altitude as well as it has a facility for the pilot to enter a reference altitude and deviation band that has to be kept. The ASI-1 airspeed indicator is a 2.25” instrument that provides a wide range airspeed indication in both digital and analog formats. Airspeed is based on the pressure generated by a pitot tube system and a static port is provided as well for use by high speed aircraft. 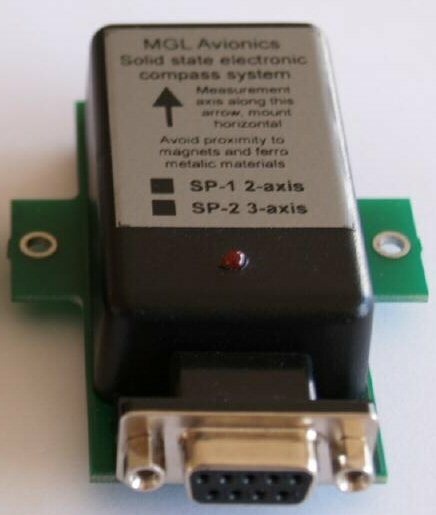 In addition, the ASI-1 provides a 24 entry automatic flight log that stores the duration of each of the last 24 flights, an air-distance trip counter and a current flight timer. Airspeed can be indicated in statute miles per hour (mph), kilometers per hour (km/h) or nautical miles per hour (knots) with the air-distance being displayed in corresponding units. The analog airspeed display can be scaled according to the aircrafts flying speed range and markers for Vs, Vf, Vno and Vne can be set. 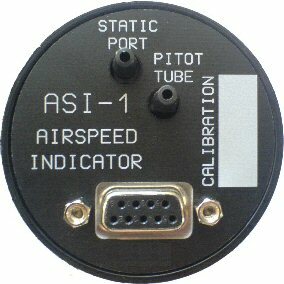 ASI sensitivity can be calibrated by the user to cater for errors caused by pitot tube placement. 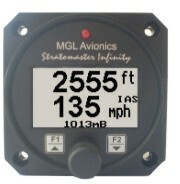 The ASI-1 instrument measures airspeed from 16mph to 250mph and is well suited to slower aircraft due to very good sensitivity and linearity at low air speeds. Measure airspeed from 16mph to 250mph and is well suited to slow aircraft due to very good sensitivity and linearity at low air speeds. 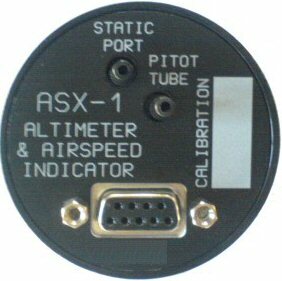 The ASX-1altimeter/airspeed combo is a 2.25” instrument based on a precision altimeter and a wide range, sensitive airspeed indicator. The altimeter conforms to ANSI standard atmosphere rules from –700 ft up to a maximum of 40 000 ft. 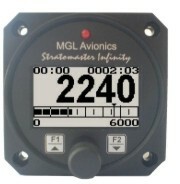 The altimeter includes an encoding serial output that, when used in combination with MGL Avionics CNV-AT, provides a parallel Gillman code interface for transponders. The altimeter can display altitude in feet or meters. Local pressure can be set in millibars or inches or mercury. The airspeed indicator can show air speeds from 16 to 250 mph and is well suited for use in slow aircraft due to very good sensitivity and linearity at low air speeds. The airspeed indicator as well as altimeter can interface to a static port and the airspeed indicator is based on a standard aviation pitot tube. 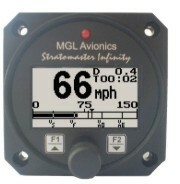 The airspeed indicator can be set to indicate speeds in statute miles per hour (mph), kilometers per hour (km/h) or nautical miles per hour (knots) with the air-distance being displayed in corresponding units. The airspeed sensitivity can be calibrated by the user to cater for errors caused by pitot tube placement. The ASX-1 also outputs airspeed information via the airtalk protocol for interfacing to the Infinity FF-1 (fuel flow computer for single or dual fuel tanks) and the SP-X (AHRS) instruments. 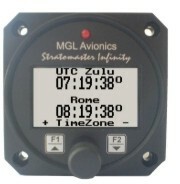 In addition the ASX-1 provides a 24 entry automatic flight log that stores the duration of each of the last 24 flights, an air-distance trip counter and a current flight timer. The ASX-1 is the ideal instrument for installations were panel space is at a premium. 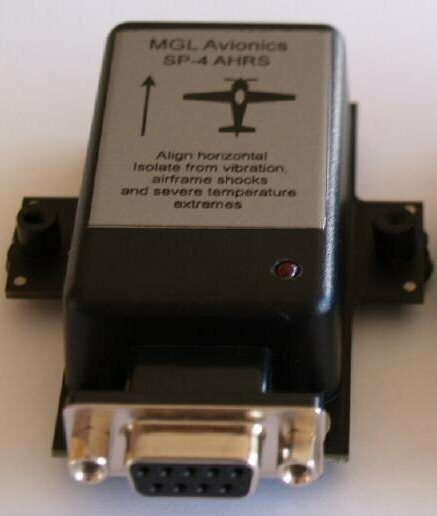 Provides a parallel Gillman code interface for transponders when used in combination with the MGL Avionics CNV-AT. The altimeter can display altitude in feet or meters. Local pressure can be set in millibars or inches or mercury. Airspeed ranges from 16 to 250mph and is well suited to slow aircraft due to very good sensitivity and linearity at low air speeds. Airspeed can be displayed as IAS or a calculation based TAS. Serial AIRTALK output for SP4, FF-1 or CNV-AT converter for transponder. 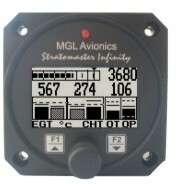 The AV-1 is a 2.25” instrument that can be used as a display interface for an artificial horizon reference system (AHRS) or as an advanced digital compass, or both depending on which MGL Avionics sensor modules are connected to the AV-1. You can also share sensor packages between various different size instruments eg. AV-2 units (these have a 3.5” display). For example you may want a 3.5” horizon display but a 2.25” compass/turn and bank indicator. 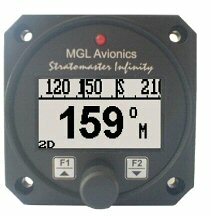 Artificial horizon reference system (AHRS) display unit with slip indication as well as turn and bank indication. 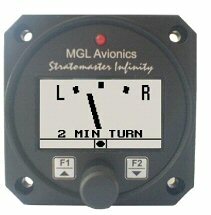 Advanced magnetic compass with course steering feature. 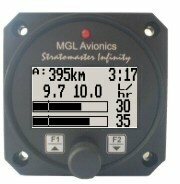 Can be setup as an individual compass display, artificial horizon or both. The AV-1 is connected to the sensor packages by a simple 2 wire communication link. This allows for the optimum placement of the sensor packages in the aircraft. More then one AV-1 can be connected onto a airtalk link. This allows for displaying the compass, artificial horizon and the turn and bank indicator on different AV-1/2 units. The BAT-1 is a 2.25” instrument used to monitor your aircrafts battery power supply. It can be used on lead-acid, NiCad batteries as well as gel cells. This instrument is very useful in determining your battery’s health, charging status, as well as the current load consumption of your aircraft. The BAT-1 can be used in both 12V and 24V aircraft and can measure voltages up to 30V DC. The BAT-1 uses a standard 50 mV shunt to measure the current making the unit capable of measuring currents from 5A to 500A.The instrument contains a programmable low/high voltage alarm to automatically detect bad batteries and alternator failures. 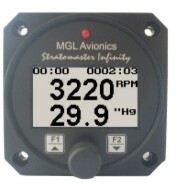 The E-3 universal engine monitor combines in one compact 2.25” format instrument all that is needed to monitor the majority of smaller aircraft engines from two-stroke ultra-light engines to medium sized four strokes such as those from Rotax, Continental and Lycoming. Most automotive engine conversions can also benefit from the use of the E-3 engine monitor. The E-3 can measure up to 4 EGT/CHT channels, a RPM input, a universal temperature sender input and a universal pressure sender input. 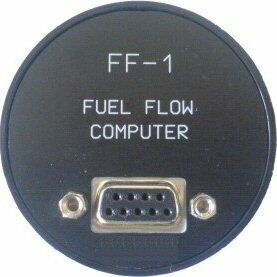 The FF-1 fuel management computer is a 2.25” instrument intended for efficient monitoring of fuel related information for single or dual fuel tanks onboard small aircraft and related applications. The FF-1 unit can connect to one or two fuel flow senders, one or two fuel level senders or both. Full functionality is available with both senders or only with a fuel flow sender using calculated fuel levels based on fuel usage. Differential or Additional fuel flow calculations are also supported for fuel return systems. Fuel injector systems are also supported. Standard automotive fuel level senders can be used, even with odd shaped tanks due to a comprehensive, multi-point calibration system. Most fuel flow senders can be used and the K-factor of the sender can be entered into the system for simple calibration. 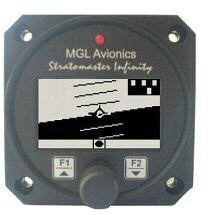 MGL Avionics supplies a lightweight dual range fuel flow sender that is ideally suited for the FF-1. 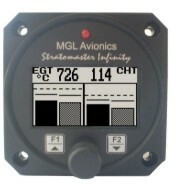 In addition, the FF-1 can be connected via the airtalk communication link to the Stratomaster Infinity ASX-1 for automatic range calculation which is based on current fuel usage, fuel remaining and current airspeed. It can also use Ground Speed if connected to a GPS providing the "GPVTG" message. 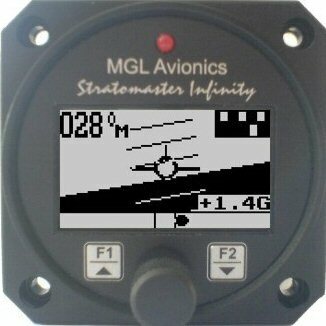 Do you want to try an MGL Infinity FF-1? Its possible right now by downloading the simulation program (requires a PC running Windows NT, 2000, XP or VISTA) which simulates the operation of the "Infinity" instrument. 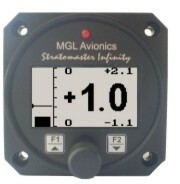 The simulator allows you to almost fully operate a virtual "Infinity" instrument. Perfect for learning how to use it without using a physical instrument, at home or at your club, ! The GF-1 is a 2.25” g-force meter capable of measuring G-forces exerted in an aircraft up to +-10G. The forces acting on the aircraft is easily seen on a large backlit graphics display both numerically and graphically. The GF-1 also has the facility to record maximum G-forces obtained in permanent memory as well as it has a temporary memory to record G-forces reached from the time of power up. It also features 2 independent cycle counters to capture the amount of times a preset force has been exceeded. The GF-1 is able to measure G-forces even if the instrument is not mounted exactly in the vertical axis of the aircraft. Two independent cycle counters record the number of times a preset force has been exceeded. Quick calibration function for operation at temperature extremes using Earth gravity. The MAP-1 is a 2.25” instrument which can measure pressures in the range from 0.25 bars (3.6 PSI) to 2.5 bars (36.2 PSI). Pressure can be displayed in millibar, bar, PSI, Kg/cm2, inches of Mercury, millimeters of Mercury, kilopascal (KPA) or atmospheres. The pressure display is also available in the form of an analog bar graph with user selectable sensitivity. The MAP-1 is primarily intended as manifold pressure gauge, however, due to the universal nature of this accurate instrument it can be used for many other applications as well. The MAP-1 also includes a programmable low/high alarm. Can measure pressures in the range from 0.25 bars (3.6 PSI) to 2.5 bars (36.2 PSI). Mercury, millimeters of Mercury, kilopascal (KPA) or atmospheres. The RTC-2 is a 2.25” aviation Real Time Clock featuring a two time zone system, stopwatch, countdown timer, alarm and OAT (Outside Air Temperature) display. It is primarily intended to show UTC time (also known as Greenwich Mean Time, GMT or Zulu time) together with a local time to facilitate ordinary ATC time reporting. Each time zone may be programmed with an additional hour offset to allow for summer time or similar variances. Local offsets may be added or subtracted. Stopwatch and Timers can be operated simultaneously to a programmable alarm, making the RTC-2 particularly suitable for sport flying competitions. OAT can be shown in either degrees Celsius or degrees Fahrenheit. The RTC-2 can be setup to automatically or manually alternate between the different time display screens and the OAT display. Time is maintained by an internal lithium battery which can be replaced by the user. The RV-1 universal engine RPM and rotor RPM unit is a 2.25” instrument providing a universal RPM counter that can be adapted to a variety of roles. Typical uses are engine RPM displays or Helicopter / Gyroplane Rotor RPM displays. The RV-1 displays RPM in a digital readout as well as in a scalable analog bar graph display. In addition the RV-1 provides a 24 entry automatic flight log that stores the duration of each of the last 24 flights. It also has a Hobbs meter (can be set to the current engine time) which is password protected,an engine running timer/flight timer and a programmable maintenance timer to schedule routine engine maintenance. The RV-1 also features programmable Low and High RPM alarms as well as it records the maximum RPM reached in permanent memory. Measures RPM from 0 to 20000 RPM. Includes a settable Hobbs meter (Password protected) and an engine running timer/flight timer. The TC-1 thermocouple display unit is a 4 channel 2.25” instrument that contains all the features necessary to monitor EGTs and CHTs. The instrument is fully programmable by the user resulting in the most flexible solution available. It contains 6 different display screens to allow easy customization. The TC-1 can be configured to group EGTs/CHTs to common settings or each thermocouple channel can be independently setup for temperature ranges as well as alarms and probe types. The TC-1’s high accuracy is due to its built in thermocouple linearization curves and cold junction compensation techniques. Temperature probes can be common K or J type thermocouple probes as used in CHT or EGT sensors. Temperatures can be displayed in degrees Celcius or degrees Fahrenheit from -270ºC to 1370ºC (-454ºF to 2498ºF). Each channel also offers a programmable high alarm. The TC-1 also records maximum temperatures reached for each channel in permanent memory. Temperatures can be displayed in degrees C or degrees F from -270 ºC to 1370ºC (-454ºF to 2498ºF). The TP-1 is a 2.25” universal temperature/pressure gauge which can be setup to display oil temperature, coolant temperature, oil pressure, fuel pressure, manifold pressure and boost pressure. The TP-1 gauge can be programmed by the user for a variety of temperature/pressure ranges and can be adapted to many types of senders. Temperature can be measured using standard automotive NTC senders as well as the MGL Avionics semiconductor sensor. Pressure can be measured using standard VDO automotive senders as well as linear pressure transducers. Three axis magnetometer with accelerometer based tilt compensation. Relaxed installation requirements, no error due to bank or pitch alignment. This compass will still display errors during a turn due to the accelerometer not being able to vector gravity correctly. The 2HRS10 package is made up of 2 units, the SP-2 Compass module with an Infinity AV-1 "Airtalk Viewer" display. Completely solid-state, this unit does not rely on traditional mechanical gyro systems. This means no limitation during usage, full 360 degrees operability in both pitch and bank. This unit represents the future of aircraft horizon systems at a price that is making everything else obsolete. Composed of one SP-4 Attitude module and one Infinity AV-1 "Airtalk Viewer" display. Composed of one SP-4 Attitude module and one SP-2 Compass module with one Infinity AV-1 "Airtalk Viewer" display.